People often ask me about the design process involved in a jewelry commission, so I thought I would document a recent example. Andrew proposed to Alex on the top of Mount Roraima in South America with a ring he made from a quartz crystal he found in a river bed. 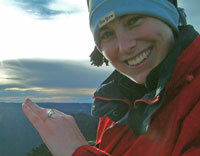 When they returned from their travels Andrew asked me to design and make her engagement ring. The following documents some of our correspondence about the ring design and includes renderings of the other designs we considered. I felt the ring design should have some connection to Mount Roraima, so the first thing I did was to research the area. In particlular I was interested in whether any gems were mined there. Amongst other less precious stones, Roraima produces fancy coloured diamonds. 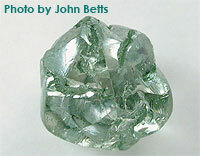 It struck me how befitting it would be to incorporate a diamond from Roraima in the design. 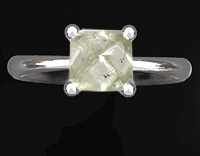 However rough diamonds from different origins are often mixed prior to being sold on for cutting and polishing. This means that it can be very difficult to establish what has been called the "fifth C" - Country of Origin. In my first e-mail to Andrew I suggested that we use their trek up Mount Roraima and/or his quartz crystal ring as inspiration for the design. I also mentioned the possibility of using a natural diamond crystal rather than a cut stone to reflect the quartz crystal ring he made for her. "..... I like the idea that the stone would have a more natural appearance. 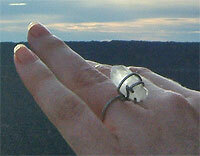 The crystal I found was a hexagonal rod of Quartz which came to a clean point at one end. 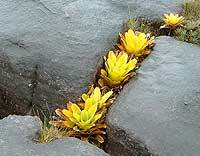 They were quite amazing in the way they looked like they had been cut, but had formed naturally. I found it in a stream lined with crystals, which cascaded between the black rocks with a pink sand bed .... I was thinking about the way the top of Roraima was criss crossed with lines of erosion from the perpetual rainfall creating block like forms. In these ravines grew the bromeliads you see in one of the photos attached. 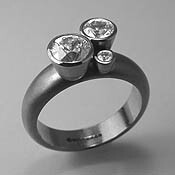 Maybe such a block like form could hold the stone....."
Design 1: With Andrew's crystal ring in mind, the design above uses a round platinum wire setting to hold natural Octohedral Diamond Crystal. Natural Diamond Crystals are found in numerous different forms, cubes, spheres, dodecohedrans and octohedrons amongst others. Design 2: Reflecting the yellow bromeliads they came across on their trek, this design incorporates a large yellow sapphire in a heavy walled setting. 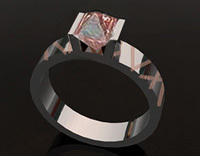 22k gold striations crisscross the grey 18k palladium white gold ring shank. 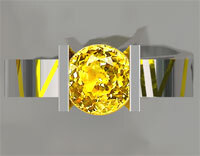 Design 3: Here small yellow sapphires are set in ravines around the ring. 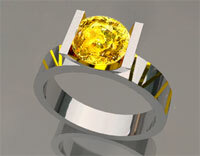 Design 4: Here again a natural octohedral diamond crystal is used, but this time held in a heavier setting. 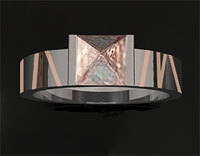 18k pink gold striations across the band evoke those on the river bed where Andrew found the Quartz Crystal. Andrew and I discussed these designs. He very much liked the idea of a diamond crystal in its raw form and was fairly confident that Alex would like it too. He prefered the heavy walled setting in design 2 and design 4, but didn't think mixing two colours of metal was Alex's style so we agreed to stick to platinum. And so began the hunt for a suitable diamond crystal. I had been able to find crystals from South Africa and Australia fairly easily. Alex was born in South Africa, so there was some link there, but what we really wanted was a crystal from Roraima. After literally months of searching we found a two suitably clean crystals through John Betts Fine Minerals in New York. One of them was a green sphere shaped crystal with natural sparkle and facinating crevices cut into its surface. 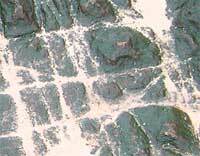 Diamond crystals from the Roraima plateau are sometimes green to brown in colour due to exposure to natural radiation from uranium and thorium in their host rock. 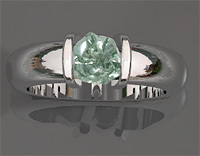 I e-mailed Andrew a final design rendering showing how the green diamond crystal from Roraima would look set between two heavy platinum walls. 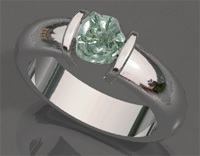 I suggested a rounded ring shank rather than flat to compliment the spherical crystal. 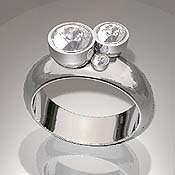 We also agreed that the ring and setting should be clean, crisp and polished in contrast to the rough diamond. Alex loves her engagement ring and the time and thought Andrew put into it's design makes it all the more special. 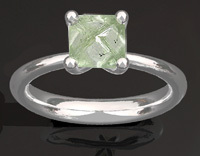 Click here to see the finished ring. 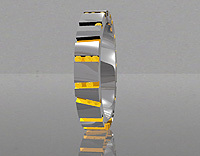 This example shows how Janet's ring was made using CADCAM. 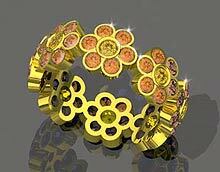 I designed a number of rings with CAD and sent Janet renderings of the rings from different angles. Designing and making a piece with CAD means that both the person comissioning the piece and I can see exactly how the final piece will look. We have agreed on the precise dimensions of the piece and the renderings give us a good feel for how well the choice of metal and stones will work together. Once we had finalised the design, the CAD file was e-mailed to a casting company (www.nf-castings.co.uk) who milled my design from wax. 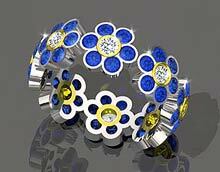 From this milled wax model they produced a one-off cast of the design in 18k White gold. I was very keen that in casting this piece we didn't forfeit the crisp high quality finish achievable with a completely hand fabricated piece. 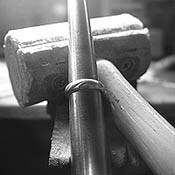 For this reason the ring was milled and cast in three pieces (the two sides and the centre section) and I then hand polished and soldered the pieces together. The final result is as good as if it had been fabricated from scratch, and the time saving meant that the ring became far more affordable than if it had been completely hand made. 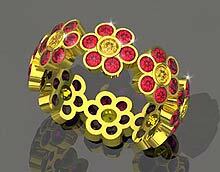 Clients are often interested in how a piece of jewelry is made. 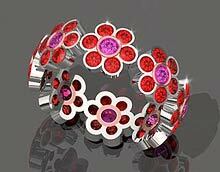 My pieces are either made completely by hand from sheet and wire, or a one off cast is made using CADCAM technology. I employ whichever method will give me the highest standard of fit and finish. 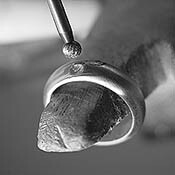 The following illustrates how the 'Three of us' ring was made by hand from white gold. The 'Three of us' ring was designed with CAD, but fabricated by hand from metal sheet and wire. Here are some pictures of its fabrication. 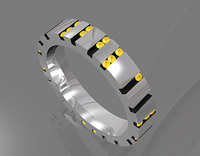 A CAD Rendering of the chosen design Forming the ring shank around mandrel with mallet Filing the cups in which the stones will sit. Sawing a round disk for the bottom of the cups. 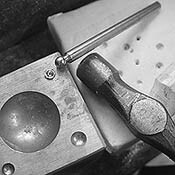 Doming the round disk with a dapping block and dapping punch. 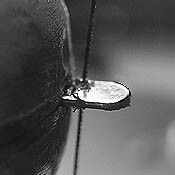 Soldering the dome to the bottom of the cup. Burring seats for the cups. Soldering the cups to the shank. 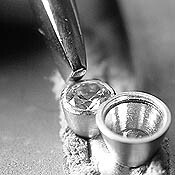 After the seats for the sapphires have been burred and the insides of the cups polished, the sapphires are carefully hammer set in place using hammer setting tools. The finished ring. 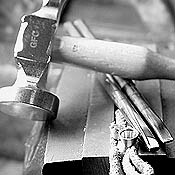 I read an interesting article on silversmithing.com about a new silver alloy called Argentium. Argentium Sterling Silver is a registered and patented alloy developed by trained silversmith and tutor Peter Johns at Middlesex University England. 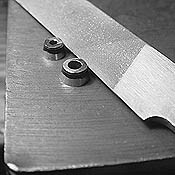 The alloy, unlike standard Sterling Silver is tarnish resistant. Any faint tarnish that may develop can be easily removed with ordinary water and a sponge. The alloy is also resistant to firestain, a purple stain which occurs in Sterling Silver when it is heated during fabrication. 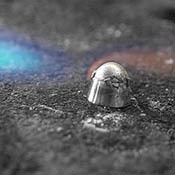 Firestain spoils the high shine of a silver object and can take hours to emery away. 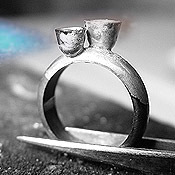 Sterling Silver is 92.5% silver and 7.5% other metals, usually copper. 100% silver would be too soft to be used for jewelry purposes, so copper is added in order to produce a harder alloy. However the copper within Sterling Silver oxidizes when heated, causing a purple stain just under the surface of the metal. Argentium Sterling Silver contains 1.2% Germanium which reduces this purple firestain.